Official Australian Distributor for Kodak Video Monitors, Tend Cameras & Havit products. The HAVIT HV-MS55GT Wireless Vertical Mouse uses a contoured shape to seamlessly fit your palm, allowing smoother movement and preventing wrist strain. Scientific ergonomic design helps preventing possible mouse arm or tennis elbow (RSI syndrome), perfectly fits your palm (right-handed) and allow smoother movement. 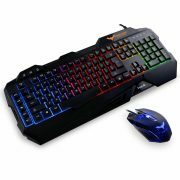 Easy to switch among 800/ 1200/ 1600dpi; Easy to control the mouse while using with 6 buttons (Forward button, Back button, Left button, Right button, Scroll Wheel, DPI button). 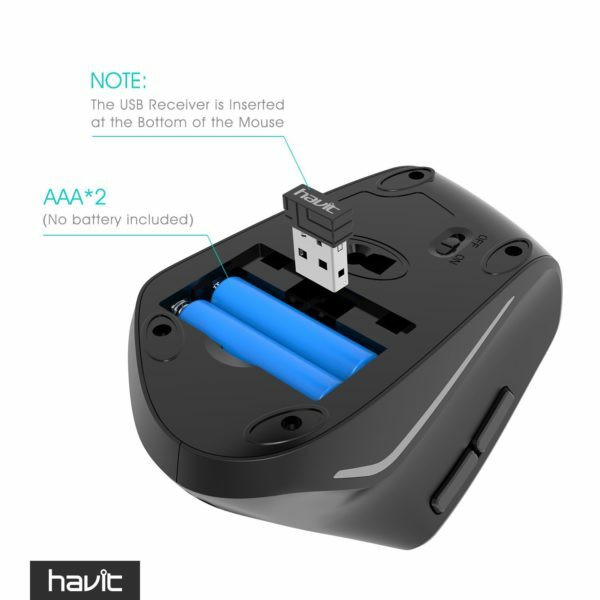 Just plug the included USB Nano receiver of the HAVIT HV-MS55GT Wireless Vertical Mouse into your computer’s USB port, with no extra driver required, and soon ready to enjoy the convenience. 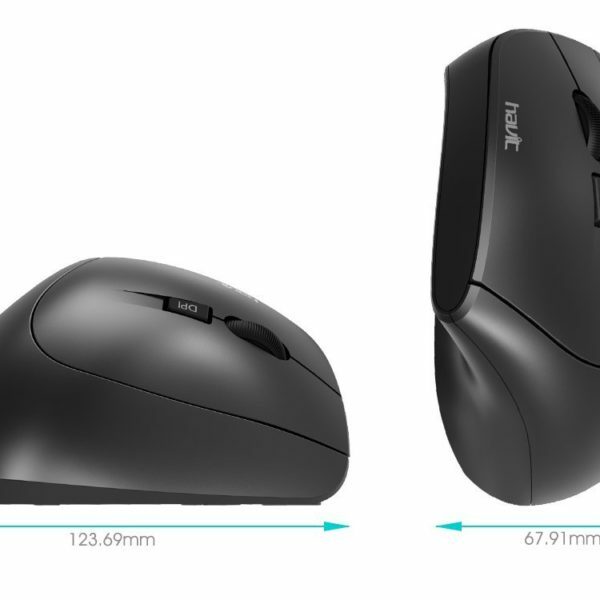 See my attached photos for a visual representation of the mouse, its size, and a comparison to my standard gaming mouse. I had never tried an ergonomic mouse before. I primarily use my Anker Gaming Mouse which has been perfect for gaming and everyday use. However, I was noticing, that over time of continuous use, my hard would start to cramp up and feel fatigued. After doing some research, I realized that this was a result of that hand shape you make for a long period of time when using a mouse. 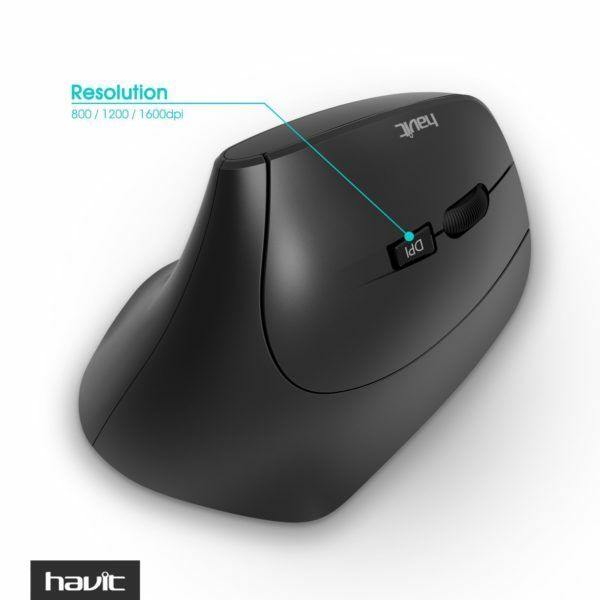 An ergonomic mouse such as this one by Havit, relieve this by allowing your hand to remain in a more relaxed and natural shape when using it. I will say, it does feel a bit weird to use at first if you haven’t tried one before. It looks huge in comparison to a standard mouse, but it’s actually no different to use. The reason it’s so big in comparison, is because it’s forcing your hand to not tense up and make the fist kind of shape you do with a standard mouse. 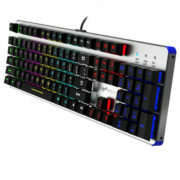 -The top has your left, right click, mouse wheel (clickable), and your DPI selection button. -This takes 2 AAA batteries. -This mouse has an on/off button on the bottom. -This does have a side ambient light on the left side. Not exactly sure how it’s activated or controlled, however. -This is a no frills all black, all plastic design. It looks pretty plain and isn’t very exciting. It looks simple and doesn’t really attract your eye. At this price point, you’re not really expecting it to look that great. Despite that, the minimal look does have a certain sleek factor. -The mouse does have an on/off button on the bottom which surprised me. It’s nice to have to make sure it’s not sucking power when not in use. -Compared to the Anker Gaming Mouse I have, the plastic used here, a matte finish, is less susceptible to fingerprints and accumulating grime. This is a big plus for me as my other mouse got build-up fast. -The part of the mouse you’re actually holding feels good in the hand and to use. However, I will say, that some of the corners which you don’t touch such as the front and bottom, are rather angular and “sharp”. Not an issue when using at all, but it does remind you this isn’t necessarily the most premium mouse. Again, not really expected at this price point, but should be noted. -2 AAA Batteries – Most of my mice use a single AA battery which I prefer. It’s much easier to replace one battery than 2. On top of that, batteries are not included which I think normally are. -Battery Compartment Door – Similar to other mice, getting this battery door open is a pain and can require an additional prying tool. I don’t know why most mice have to be so hard to open. Aside from some minor issues and a plain styling, I’m digging this ergonomic mouse style. For a wireless ergonomic mouse, this seems to be priced appropriately. You’re getting a well built mouse that is comfortable to use but that might leave you desiring a little more. At this price point, I think gets the job done well. It’ll help you avoid hurting your hand and getting fatigue with long PC sessions. A perfectly brilliant! 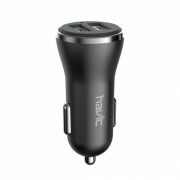 The product is a very nice look, really well made, I bought this two weeks ago,works well,very useful for its intended purpose,Would recommend. A really outstanding mouse to use! It feels really comfortable to move around. Once I lay my hand on this mouse, I felt the difference. i feel very comfortable to rest my hand on it, and my palm gets support. I wish I could bring my own mouse to work. Plus, the forward and backward buttons made website browsing super easy. I love it! As soon as I received it, I love it right away! The quality was a plus, pretty sturdy, at same time it light enough to move around, and has great button feel. Which truly enhance the efficience of daily work. I am highly recommend it, to anyone who are looking for look, quality, and price. This one, it a winner on my list. Decent product. One drawback is that the material is too smooth, requiring you to grip tighter to control and press buttons. If this had a grip surface, it would have higher rating. The build quality has too many plastic and flimsy feeling parts to make me think that it will last a long time. 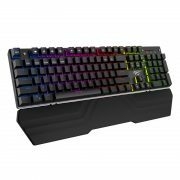 The mouse functionality and ergonomics? Just what I expected. First off, I placed my order and received my mouse in 2 days. Great shipping service. Hand position on this mouse is extremely ergonomic and I have taken the hand cramps completely out of my work day. I 100% recommend, 5 stars. love it! I ordered this for myself and then my boss wanted it too, she loves it too. LOVE it! So much easier for my arthritic hands. Purchased one for my hubby, too. my hand is a little big, but it works well and feels good. 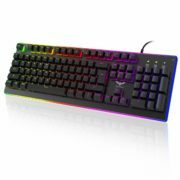 Not good for gaming but great for normal use. This. It was simple to setup and the shape feels natural. I’m on the computer all day for work and can see this making a big difference going forward. It was inexpensive and so far seems to perform well. To set it up, just plug the USB connector into laptop, putting batteries in the mouse, and flipping the switch to on, wait a few minutes for everything to sync up and it will be ready. Will recommend it! I have had no problem with my hand going numb with this mouse. Very comfortable. Only changes I would make is 1) A soft click and 2) A textured surface on the outside. I am not tech savvy so more of an explanation on the differences in the DPI settings would be helpful, too. My three year old Microsoft mouse finally needed a replacement. This is excellent ergonomic mouse .But if u never had one before I think it will take couple day use to the feel. 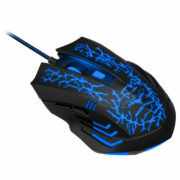 This is the new design mouse and it’s worm shaped bionic design very consistent with the physical principle. I work for a long time in front of the computer with the mouse, it’s so comfortable and my hand no longer tired. I am so happy to purchase it. Highly recommend it!!!!! Wonderful design~~much more comfortable ~~ I love it. Bought this ergonomic mouse due to my long term “mouse wrist”. I have been using it for a week, so far feel comfortable with it, seems like being able to relieve some pressure on my wrist after a whole day work. Nice design, will buy another one for my son. This really helps with my wrist tendinitis. It takes a bit to get used to. You do end up moving your whole arm a lot more, so if you have shoulder issues, it might not be the best for you. My friend bought the mouse. I tried it before I bought this one. Its shape doesn’t like a normal mouse. When you put your hand on it, you can feel your hand fully attach on it. That’s why I asked my friend for the link and got one for myself. work great especially for ppl with tennis elbow… a bit sensitive but thats because I’m used to an old style mouse … give it a try… you will donate you the mouse! Good quality ergonomic mouse and mouse pad. I’ve been looking for a big mouse pad.I bought the wireless mouse and the mouse pad for my husband. The mouse is very comfortable. Feel very relaxed on the wrist. very comfortable to use. Highly recommend. Love this mouse. Never had an ergo mouse before and I love it. I had some slight pain across the bottom of my forearm into my wrist, and this has a subtle/gentle reorientation of that positioning, finding a very natural position. I like to keep my mouse fairly high relative to my [slumped] desk chair. Solid tracking, good responsiveness. Don’t know much about the DPI stuff except the middle seems good. The hyper one is crazy and the slow one appears to be for old people? Overall, great buy. Reasonable pricing, have yet to use the functions of it… waiting to see the battery life on it. So far so good. Impressive mouse. This mouse is easy to set up. I love it as it really takes pressure off my wrist. The design is practical for reducing wrist strain. Enjoy the ergonomics of this mouse! Bought 2 so far one for home and one for the office. No issues with me from here! Great product! I was looking for a new wireless mouse and stumbled upon this beauty. After a few days of use, I am loving it! It fits in my hand comfortably, responds well, and looks cool! This mouse is my favorite. Using it at work after a full 8 hours my wrist feels no discomfort. Responsive and well made. Love it, using it now. As soon as I opened this from the box, I had to laugh. I had never used an ergonomic mouse before, so the shape is honestly really funny to look at for the first time. But once I loaded in the AAA batteries and plugged it into my laptop to use it, I was sold. This mouse makes every other mouse I’ve ever used feel like a primitive brick. It’s incredibly comfortable and the design just makes sense, even if it is a little goofy looking at first. The additional thumb buttons are used for “Back” and “Forward” in your browser and Windows Explorer. The mouse is perfect. Fits comfortably in my right hand. I am very satisfied with the products. I would recommend it. This is my go-to mouse now, works great, very easy and smooth to use. It pairs perfectly with the extended mouse pad. I really like the ergonomic design, it does feel a little funny at first, but once I got used to it, it’s reduces wrist fatigue so it feels really comfortable, now I can’t see myself using normal mouse again. Battery seems like to very long, I’ve been using this for months now, and it’s still holding strong. THE SHAPE IS VERY UNIQUE. BUT I WILL GET USED IT. good quality! i buy it as a gift to my friends. she love it so much. I bought this mouse for work because mine sucked! I love the shape of this mouse, my hand never hurts anymore and it’s super easy to go back and forth between pages. Easy to set up and use. Product is exactly as described and came really quickly. Can’t beat the quality at this price, would recommend to any golfer! This mouse is well designed with ergonomics suitable for long use of mouse at work/home. The height and curved design provides good grip without the need to strain the wrist. I am using this new mouse for last 3 days, it takes a while to adjust from conventional mouse but very comfortable to use. All in all for the price of this little guy it is a great investment. Only time will tell if it’s any better than the Logitech.This is the perfect travel mouse! I’ve been using travel mice for as long as they’ve been in existence and this one is the best I’ve come across.Awesome little mouse. 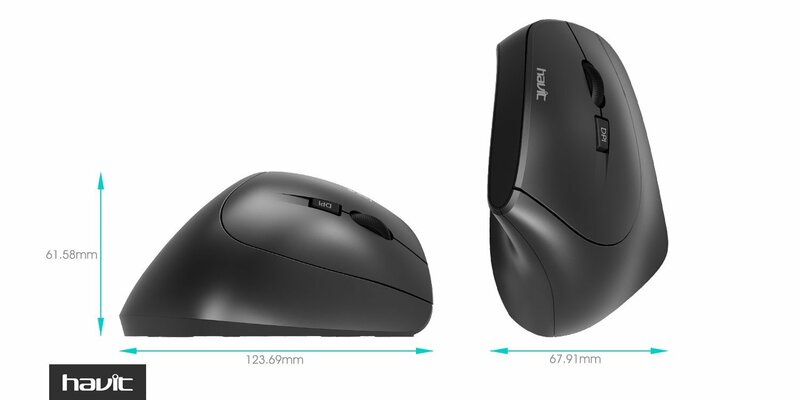 This design can reduce the fatigue of the wrist, feeling very comfortable, the mouse sensitivity is strong. the wireless mouse is very convenient. and the move of it is very smooth. it has a kind of technology looking. 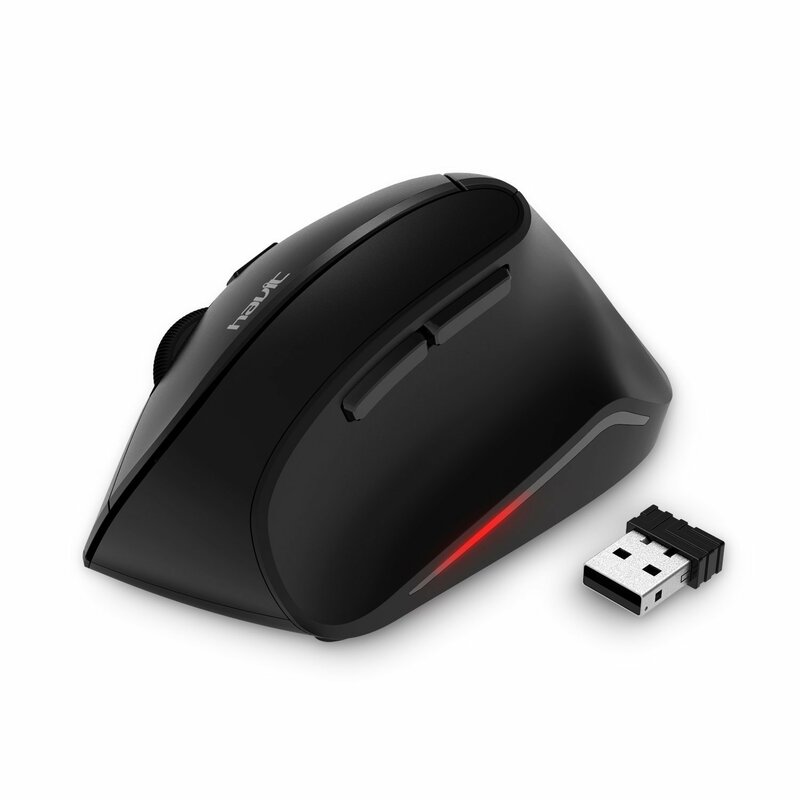 I really love the ergonomic design, it feels very comfortable and it is very easy to switch and control.This mouse works as well as you expect it too.Quick and responsive with all the same tweaks of the far more expensive wired and wireless mice. I can easily use it on just about every surface around me like fabric, wood and paper. I recommend this amazing and stunning mouse! You would never find such a great mouse! Comfortable mouse, easy to use. The typical mouse is hurting my wrist after long hours of using. So, I decide to give this ergonomic mouse a try. It took a couple of days for me to get used to it. My hand just rests on the mouse and it doesn’t require constant wrist movement. I no longer have the pain at the end of the day. It is great mouse after all. This Mouse is so good for my tendency for Carpal Tunnel. I recommend it! I’m not used to it at first, but I feel good after some time of exercising.Its design is real nice. I like it. I definitely recommend getting a more vertical mouse like this for ergonomic reasons. This is a very cool mouse. The shape is desiged with better fitting my hand. Besides, it can be used on any type of surface. MY HAND AND WRIST DO NOT HURT! I’ve been using this for two months. I love this mouse! It works like a charm. One of the old ones will never go on my desk again. I had a mouse similar to this (though it was wired) provided to me at my previous job. When I switched jobs, I was back to working with a non-ergonomic keyboard and mouse set up. I thought it would be fine, but was proven wrong about four months in. After clearing it with my supervisor, I knew that I wanted an ergonomic mouse and was ecstatic to find this one. I adore the forward/back buttons on the side and the mouse fits my hand perfectly. I love that it’s wireless because we switch our desks around at work and it will make it easier to move my mouse. My only concern is that when it arrived, the right side was popped up a little bit. It popped right back in, but it did make me cautious that there might be problems down the road. So far, so good, however, so I think it was just a fluke that occurred during shipping? Anyway, I really do like this mouse and highly recommend it for anyone looking for an ergonomic mouse. The mouse is ready to use once connected to my PC (Win 10) without any driver program. Love the easy to switch DPI level button, and back button that doesn’t need to swipe and click on the screen. The important thing is that I think many people get wrist pain problem cause using mouse for a long time. That’s why I order such vertical mouse. The design is totally suitable for human being. Recommended to PC users who has to use mouse. Works well, but wish mine came with the bluetooth adapter. But lucky for me my work laptop has a built in bluetooth receiver lol. So worked out for me. I like this kind of mouse. I never feel uncomfortable with my hand after long time usage. Great product. I am amazed at the HIGH QUALITY of this product when you take into consideration the price. Very pleased. GREAT PURCHASE!!! I love this wireless mouse. Because of holding my baby all the time, my wrist start to get hurt often and because of this mouse design, it give my wrist a rest and being using the laptop all the time, it give a perfect angle between my hand and the desk. this mouse it perfect for me. The shape of this mouse is not like regular one, but it makes use of all my fingers when operating so this design seems really smart to me. Thr size is good and since it’s wireless so makes it easy to hold. Thumb up. This is one of the best mouse I’ve ever had. Much easier to control than my Apple mouse. I have been using this mouse for a week. The outlook is very fancy. Many of my friends have asked me where did I get the mouse. Lol~~ It is very comfortable to use, fit my hand. And it is wireless! I’ve had the same standard mouse for 10 years. When it kicked the bucket last week, I decided it was time to find a really nice wireless option. While I’m not a gamer, this mouse came highly recommended so I went for it. I love it. While it took maybe a few hours to get used to the new hand positioning, I just finished my first big project using it and find it to be really intuitive and comfortable to use. My wrist is relaxed and the mouse molds to my hand as I’m working. This is a very cool nice with fashionable design. Will definitely take it to the office to show off!! The mouse is so good, I like its appearance, very beautiful. this mouse is particularly suitable for my hand to work on the computer all day. I spend a lot of time on the computer for work. This mouse completely eliminated my wrist pain after a day of use. A conventional puts your wrist in an unnatural position, causing pain. 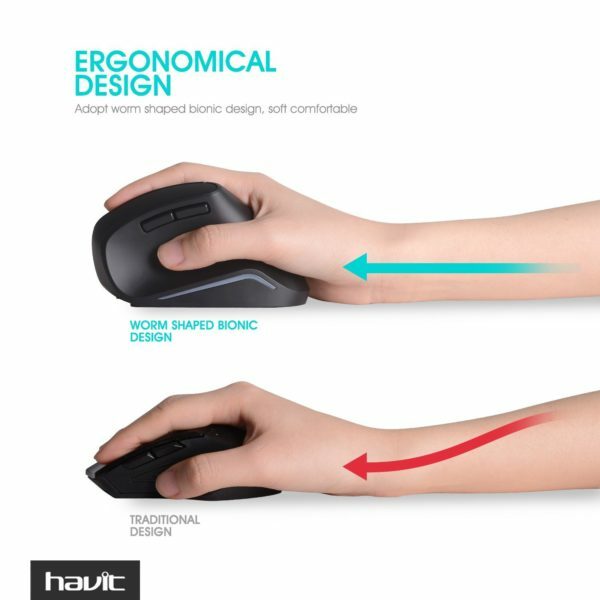 This mouse positions your wrist on the side, almost like the angle when shaking someone’s hand. The appearance of this wireless mouse is very special, I feel cool. I mainly use it to play games, very sensitive. Eased the tingling I was stating to experience in my arm. Easy to use. This mouse brought for my friend, I bought 1 similar before, I like this type vertical mouse, more comfortable, I tried this for a while, I like it too, quick sentive, value price, good quality, just my friend needs time to used to this new mouse. This is an excelent item, it’s really confortable for manage it in my house, not for travel, because is a little big. But it works perfectly iin my office. This is the second mouse of this type that I have purchased and this one is better than the first. I have wrist issues and a bone deformiity on the back of my hand that causes my tendons to rub and get sore if I click a lot. This minimizes the pain quite a bit. It does take a learning curve to use but once you do you’ll never go back to a regular mouse. Excellent mouse. The shape is completely different than a normal mouse. That takes some getting used to before it becomes normal. Now I run a few games better than I did with my normal mouse. Easy to connect and get going. Feels comfortable and well built. I love this wireless mouse. The contour shape fits my palm perfectly. It’s fast to connect to my computer, I just plug usb nano receiver into my computer’s port. It works so good with my windows 10. It is also easy to switch among 3 DPI levels. Very good mouse. Bought two these and both of them works great. Love stuff with cool designs, its value deserves more than the listing price. I received this wireless mouse about three weeks now. I bought this for my 19 year old son who lives in the campus. He called me and asked where did I buy this because most of his friends like it and they keep asking my son where to buy it from. It is very easy to set up and the shape of the mouse fit the hand perfectly.very cool looking and good quality.